The 93rd Scientific Assembly and Annual Meeting of the Radiological Society of North America (RSNA 2007) will be held November 25 through November 30 in Chicago, IL. With the theme of "Connecting Radiology," this year's meeting will feature >1675 scientific papers and 604 poster presentations. It is expected to draw >10,000 North American and >5,000 international radiology professionals. Approximately 750 companies will exhibit products in the 553,000 square-foot exhibit halls. The Medipattern Corporation (Booth 5515) will highlight 7 new computer-aided detection (CAD) products, including 6 versions of the company's B-CAD solution for breast ultrasound imaging as well as one for MRI of the breast. According to the company, Medipattern is the "first company to cross the modality boundary, creating CAD products for breast ultrasound imaging and breast MRI from the same algorithm platform technology." Among the new systems featured will be the B-CAD 1.2.1 designed for breast US in the PACS environment. It includes a DICOM-net-work-ready PC with a B-CAD viewer and CAD reporting system. B-CAD 1.2.1 is also available in a software format for loading onto existing equipment. The company also plans to show B-CAD 2.2 for breast US, which is available as a software product for resellers to load onto workstations and as a plug-in module for the Sectra IDS5 workstation. This version electronically analyzes breast masses using the American College of Radiology's BI-RADS (Breast Imaging Reporting and Data System) categories. It gathers the information required to track multiple lesions and automatically documents the results in a preformatted report. The company's morphology CAD for breast MR will be featured as part of Confirma's (Booth 7950) Version 5 CADstream. This solution was designed to perform detection and characterization of features based on physical shapes or morphology within an MR image of the breast. Codonics (Booth 1921) will display the Virtua XR Medical Disc Publisher (Figure 1). 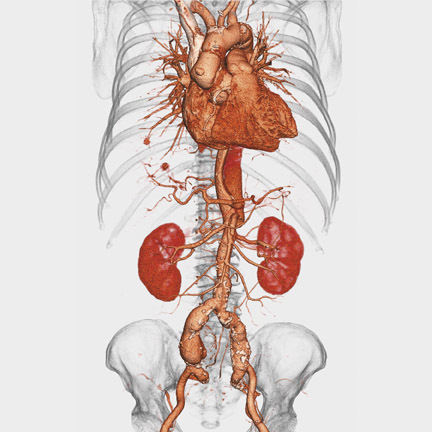 This system is specifically designed for high-volume imaging applications such as breast MR, PET/CT, MR angiography (MRA), and CT angiography (CTA). Virtua XR includes an embedded computer, a robotic disc handler, dual CD/DVD drives, an integrated high-speed color label printer, and a 15-inch LCD touch-screen display. It has two 50-disc input bins that hold 100 CDs, 100 DVDs, or 50 of each. Users can select CDs or DVDs, or allow the software to automatically select the correct media based on the size of the study. The built-in printer produces water-resistant CD and DVD labels. Virtua XR can operate as a stand-alone DICOM peripheral or with the company's Horizon Multi-media Dry Imagers. The company will also showcase its Horizon XL Multi-media Imager, a dry imager that supports 36-inch and 51-inch film output for digital applications. Designed for printing long bone, scoliosis, and pediatric and adult spine studies on long film for surgical planning, the imager prints true-to-size digitally stitched images from CR/DR applications on 1 continuous film. Available in 2 sizes, the 14 × 36-inch (35.6 × 91.4-cm) and 14 × 51-inch (35.6 × 129.6-cm) dry film is daylight-safe and folds to fit in a standard film jacket. Visage Imaging (Booth 2591), a subsidiary of Mercury Computer Systems, Inc, will showcase its scalable PACS solution with integrated clinical applications based on Web and thin-client technology, Visage PACS/CS and the newest release of Visage Cardiac Analysis, a CT cardiac application.Visage PACS/CS was designed to "enhance the entire clinical workflow with advanced tools for 2D, 3D, and 4D image review and interpretation, postprocessing, data management, and image distribution." Applications and image data are accessible anywhere within the PACS workflow across the entire healthcare enterprise. Users can access data and 3D performance both inside and outside the hospital on workstations, PCs, and laptops. According to the company, this most recent version "provides improved performance in wide-area networks and over slow DSL lines, thus enabling efficient remote operation across distributed imaging centers, providing better services to referring physicians, and opening new ways for reviewing images efficiently from home." 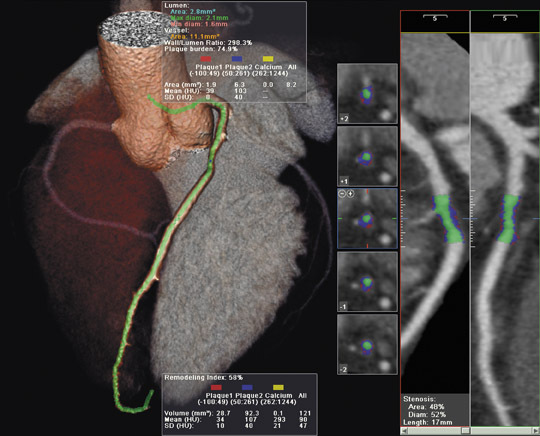 The company also plans to showcase the latest version of its Visage Cardiac Analysis package (Figure 2), which offers calcium scoring, myocardial segmentation, wall thickening computation, enhanced reporting capabilities, and improved manual editing tools. TeraRecon, Inc. (Booth 7762) will demonstrate thin-client technology with the i N tuition platform architecture on the Aquarius suite of products at RSNA 2007. The new Aquarius i N tuition client was designed to deliver workstation-class applications to PACS stations and standard PCs throughout an enterprise. The company notes that this system "blurs the line between advanced 3D workstations and thin-client 3D, so it is no longer necessary to choose between the two and accept compromises." The company will also feature the following innovations available on the i N tuition Edition of the Aquarius product suite: support for dual-energy CT, automatic anatomy identification and labeling, CT/PET fusion with automatic registration, and fusion for blood pooling MR contrast agents. The system also provides parametric mapping for time-dependent MRI (such as breast MRI), CT/CTA registration and subtraction for CT digital subtraction angiography, and the ability to provide a full cardiovascular clinical work-up on a thin client. At RSNA, the company will also demonstrate the product's scalability by deploying a server cluster capable of concurrently rendering hundreds of thousands of CT slices. The data flow to multiple servers will be managed with the AquariusGATE scheduled routing technology, while the rendering load between the servers will be managed with automatic, headless load balancing, so that the cluster behaves as a single "virtual server," delivering a uniform user experience anywhere within the enterprise using a common patient list. Planar Systems, Inc. (Booth 2312) will introduce its first 16-MP, 30-inch gray-scale diagnostic imaging display at RSNA 2007. The Dome ZX features 10-bit high-resolution gray-scale glass that is designed to enable side-by-side digital study comparisons without the panning and zooming required by smaller, lower-resolution split-bezel monitors. According to the company, the Dome ZX line was designed for "the most intense diagnostic imaging applications requiring the finest precision and image quality, including CT, MRI, CR, DR, and nuclear radiology." The Dome ZX displays will be available in a dual 5-MP, dual 8-MP, a single 10-MP, or a single 16-MP configuration. Agfa HealthCare (Booth 4106) will showcase its line of CR systems, which feature the company's image identification and quality control tool, NX touch-screen interface, and its automated digital radiography image processing software, MUSICA 2 . Systems include the CR 30-X desktop system for smaller facilities; the CR 35-X digitizer for decentralized CR environments; the multiuser CR 85-X with a 10cassette drop-and-go buffer; and the DX-S solution, which quickly provides a full range of imaging examinations in environments where speed and imaging flexibility are important, such as the emergency department. Agfa also plans to launch its newest tabletop imager, the DRYSTAR AXYS. This imager provides mammography-quality images with 508-dpi image resolution and offers dual film size. In addition, the company will showcase a variety of modules for its IMPAX image and information management solution, including the IMPAX Enterprise Suite for large, multisite healthcare facilities and integrated healthcare delivery networks; the Hospital Suite for small to mid-size hospitals requiring integrated multiple specialties; and the Imaging Center Suite for imaging centers and radiology practices. Siemens Medical Solutions (Booth 7713) will show the "Triple Deployment" of its TrueD clinical application for image fusion and registration. Initially launched on only the syngo Multi-Modality Workplace, the original TrueD provided automatic registration and fusion of images from 2 time points and/or modalities. Following the Triple Deployment, a new version of TrueD will offer deformable registration for 3 time points and will be available on the syngo RT Oncologist and as part of syngo Suite, the company's flagship PACS, as well as the Workplace. While you are at RSNA, don't forget to come visit Applied Radiology at Booth 1500. Technology and Industry: RSNA 2007 preview. Appl Radiol.